In this tech-driven ecosystem, business firms from every vertical looking forward to optimizing their productivity. Besides mobile apps has also penetrated deep into numerous industries including real estate and construction. As per the recent survey, it involves more than 600 employees from the construction industry to reveals that 80% of the respondents regard mobile technology to be of high priority. Also, the reputed app developers collaborate closely with the real estate companies to build customized solutions for business. So, it is evident that everything comes down to mobile app development and their implementation across the industry. For instance, sturdy apps have developed for calculating the amount of concrete required to prevent cracking where AutoCAD help to enable the constructors to create the structure virtually. You should be aware of painting estimator and customized estimator apps which streamline the construction process to a significant extent. This construction supervisors also use apps dedicated to construction management which helps to keep them updated about the proceeding regularly. They can maintain the records as well as take a necessary decision by merely with a single tap. 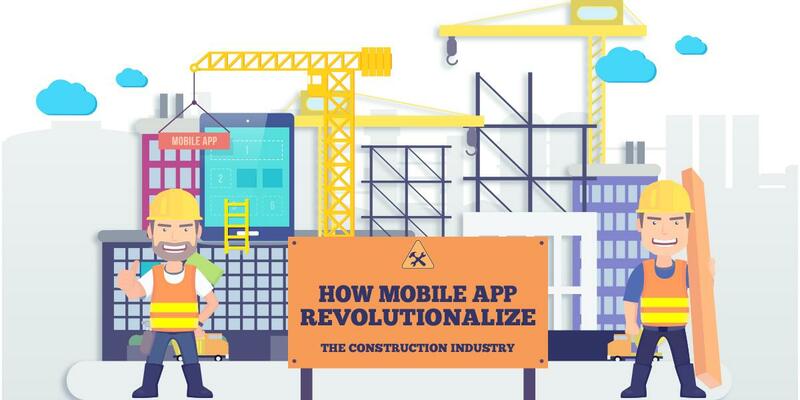 Below are the given ways in which mobile apps are transforming the construction industry. It is essential for a construction manager to improve the transparency and efficiency in the operational process where with the help of mobile apps they can carry out monitoring, scheduling and authorization of the process. It helps to deliver faster channel of communication. So, in supplier management and scheduling mobile apps can be extremely handy. Even in these days, ready-mix concrete supplier uses mobile apps through which a map interface can be shared by the supplier or with the customers which help to ensure the active management of the agreement at the service level. Substituting papers with mobile apps is a step forwards towards digitization even the clutter-free workplace help to keep the productivity level optimized. Mobile apps can help to decrease high hazards within the construction industry as compared to other sectors the rate of injury in the construction sector is much more higher. So, construction managers can keep track of training sessions with the help of mobile platforms. On ensuring regulatory compliance, they can improve the level of safety for their workers. Another benefit of using mobile apps in the construction sector is that it helps to allow an immediate reporting of injuries and safety concerns even the authorities can manage these issues with greater care. One of the significant challenges lies in the constructional industry is completing the project on time where the delay often caused as a result of rework. For instance, after the completion of a project commences, certain parts may have to be redesigned which escalates the overall cost, and the project takes more time to be complete. It is better to create 2D and 3D renderings with the help of rendering tools which eliminate hassles. Most of the constructional firms use these tools to create virtual tours and rendering which help in detecting constructional issues before the process starts. Managers can take leverages from mobile application development services by developing customized apps to sync and organize operation activities. They can easily schedule the task and ensure that construction work with the help of customized apps. At times construction manager may have to manage the process at two different sites by using these apps end user can simplify the process. Various cloud-based project management tools are available in which it enables the managers to view the projects and review the completed task. They can also get real-time data, reducing delays in the construction process. Communication is a vital part of the constructional business. Sometimes, communication gaps lead to misunderstanding between the project managers, supervisors, and owners. Flawless communication is necessary to ensure all the process remain synced together and get a complete view of it. By integrating, the right app can reduce misinterpretation of information and keep all the departments tuned together. As per the statistic, constructional worker spends only 30% of the time on their core job rest time get wasted in carrying out unnecessary tasks such as cleaning, transporting the materials, keeping the site organized and so on. With the help of mobile apps, constructional managers can optimize the works even the workers can channelize their energies only to productive areas. Also, the evolution of technologies like IoT and other mechanisms are making their way into the construction sector which can be connected to the mobile apps so that the people can keep track of their operations and control them from a single platform also construction firms can seamlessly manage all the domain within the logistical chain through these apps. Therefore Robots and drones are likely to penetrate the construction industry in the future. The profound impact of mobile application development services can be seen in the entire constructional industry. Hence, companies are left with no choice but to consider mobile app development strategically which saves time, equipment handling, better reporting, and strengthens the overall construction process. No wonder forward-thinking developers are co-operating with established app developers for customized solutions.